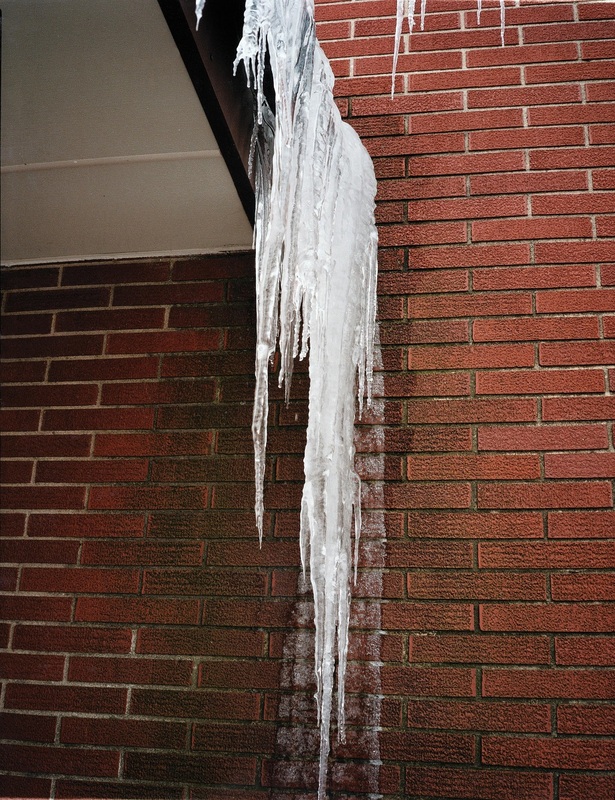 Reducing the risk of ice dams forming will help avoid water damage. Ice dams are ridges of ice that form at the edge of a roof or around drains and prevent melting snow from draining off your roof. The water that backs up behind this ice dam can leak into the building and cause damage to walls, ceilings, insulation and other areas. Additionally, when the roof doesn’t drain properly, snow, ice and water remain trapped on the roof, adding additional weight that can put your roof at greater risk of collapse. Safely removing the snow will remove the source of the ice dam. Increase insulation above ceilings. If the ceilings are suspended non-combustible mineral fiber, then install fiberglass batt insulation. If the ceilings are drywall nailed directly to wood joists, blown insulation or fiberglass batt insulation can be added. When adding fiberglass batt insulation, if there is a paper facer, place the paper side facing down. Create a roof care plan that includes periodically inspecting the roof drainage system for proper flow including drains, scuppers, gutters, and downspouts. Self-regulating heating cables can be permanently installed on gutters, downspouts, and around roof drains. Since their power is self-adjusting based on the ambient temperature, they are cost-effective. Commercial buildings with flat roofs are particularly vulnerable to water leaks if ice dams keep water from flowing into roof drains. If the building has a history of ice dams, removing the snow will remove the source of a potential ice dam. A heavy-duty push broom with stiff bristles may be used to brush off the snow on low slope or flat roofs. A shovel or snow blower should not be used since they may tear up the roof cover system. Ice dams don’t actually have to clog the drains and in fact, the drains are frequently clear and open. The ice forms a ring around the drain and sometimes a dome over the drain that keeps water from flowing. If ice dams form around the drains, heating cables can be connected to the drains to prevent ice buildup. Heating cables can be installed in a zigzag manner in gutters. Heating cables can also be placed on the roof, connecting them to the drainage system so a path is created for the melting ice to follow. If there is extensive ice build-up around the drains, consult a roofing contractor to ensure that the roof cover system is adequately sloped to the drains. When the roof is dry, inspect the roof cover for evidence of long-term standing water. This will be evident in the presence of mold, mildew, and even small vegetation growing. This indicates a problem with the slope of the roof cover system; which will reduce proper watershed and drainage. The roof cover system can likely be re-pitched with additional insulation boards by a roofing contractor. In low sloped roof buildings, the space above a suspended ceiling located below the roof may be heated and cooled in the occupied area below. If that is the case, there is no need to insulate above the suspended ceiling or seal the ceiling’s penetrations. Removal will result in better drainage and reduce the risk of water damage. IBHS does not recommend chipping or breaking ice dams due to the damage that can be inflicted on the roof. Removing the snow will remove the source of a potential ice dam. Use a heavy-duty push broom with stiff bristles to brush off the snow on low slope or flat roofs. Never use a shovel or snow blower since they may tear up the roof cover system. A roof rake may be used for most single story buildings while remaining on the ground to pull snow down the roof slope. Do not pull snow back against the slope or sideways since the snow may get underneath the cover and can break shingles. For buildings with roofs that cannot be reached with a roof rake from the ground, consult a roofing contractor. Occupational Safety and Health Association (OSHA) regulations and standards should always be followed when working on a roof. Fall protection should always be implemented when working on a roof. Having an issue with ice dams, need snow removal or would like to know how your roof is doing? Click below for a free inspection.